In recent years, scientists have become increasingly aware of a worldwide decline in the numbers of frogs. Frogs are certainly disappearing in Australia. Eight frog species have become extinct in the last 25 years, and several more are likely to become extinct in the near future. There have been drastic declines in the populations of amphibians, particularly frogs, throughout the world. Along the east coast of Australia, nine species of frog have totally disappeared in the past two decades, and scientists are at a loss to explain why or provide solutions – except for ‘human activities’ and population growth – but some reasons are still elusive. Victoria’s frogs are facing a conservation crisis according to biologists, who warn that some of the state’s amphibians have “passed a tipping point”, while others have become extinct. Nick Clemann, program leader (threatened fauna) at the Arthur Rylah Institute , said the prospects for the Baw Baw frog, Victoria’s only endemic frog species, were now considered “immediately bleak”. The frog is now only found on the forested western slopes of the mountain. It’s tiny, it breeds underground and it can only be found in Victoria’s eastern Alpine region of Mount Baw Baw and one highly protected shipping container in inner Melbourne. The spotted tree frog, found in rocky mountain streams in north-eastern Victoria, is also battling shrinking numbers, with more than half the known populations believed lost. Those that remain and are being monitored and are showing a gradual decline. Their survival is threatened by chytridiomycosis, the waterborne disease attacks the keratin in the skin and threatens all frog species. There is no effective infection control for the fungus in the wild. To help combat the decline of Baw Baw frogs, Melbourne Zoo converted a shipping container that simulates alpine conditions, and has succeeded in establishing a small ‘insurance’ population base of 57 frogs. The southern corroboree frog is one of Australia’s most endangered species. Arguably one of the most striking of Australia’s species, the southern corroboree frog is endemic to Australia, and in fact only lives in small pockets entirely within Kosciuszko National Park. ‘Corroboree’ refers to a meeting or gathering of Aboriginal Australians where participants often adorn themselves in white striped markings. Threats include human impacts such as climate change, fire and habitat disturbance, as well as feral animals. But the biggest problem is the chytrid fungus (Batrachochytrium dendrobatidis), which has been decimating frog populations around the world. Frogs, more than any other terrestrial animal, need water to survive. 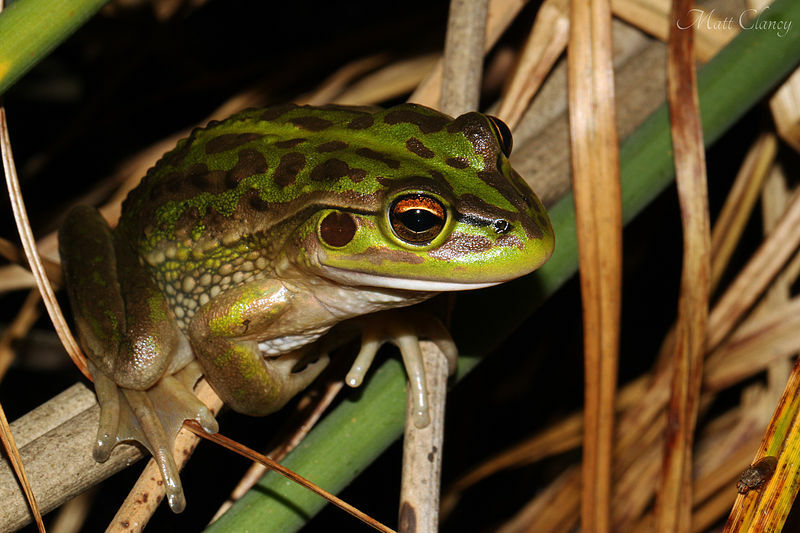 In inland wetlands in NSW, water can be scarce for years and then suddenly abundant, and frogs depend on the flooding of wetlands to successfully breed. Eighteen species of wetland and river frogs – a quarter of all frogs in NSW – are listed under the Threatened Species Conservation Act 1995. They include the green and golden bell frog, southern bell frog , stuttering frog, corroboree frogs, alpine tree frog, sphagnum frog and wallum froglet. The plague minnow (Gambusia holbrookii) is a small fish sometimes called the mosquito fish. It was originally introduced to control mosquitoes but was not successful in doing this. It is now common and widespread, and known to eat native frog eggs and tadpoles. Other exotic fish – such as trout, carp and goldfish – also eat native frog eggs and tadpoles. Loss of habitat: Humans can damage frog habitat in many ways. For example, people:clear large areas of native vegetation for housing and agriculture. frequently burn patches of bush which frogs shelter in reduce the quality of wildlife corridors, which connect areas of frog habitat. This makes it difficult for frogs to move from one area to another. In our Western, consumer-based economy, underpinned by high population growth, there’s heavy competition for development of frog habitats. 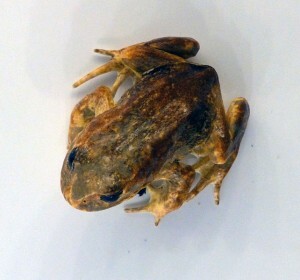 ‘Banana box‘ frogs are displaced frogs that have been inadvertently moved from their normal habitat, usually in containers of fresh produce or landscape supplies. As displaced frogs pose a serious risk of spreading disease to local native species, they must be treated as if they are carrying an infectious disease and must never be released into the wild unless special approval is given. Lost Frogs’ Home, nursed back to health in quarantine and eventually placed into a caring home as a family pet. The culling of cane toads has been widely encouraged as they are displacing native Australian frogs. Some of our native Australian frogs look a bit like cane toads. Cane Toads are large heavily-built amphibians with dry warty skin. They have a bony head and over their eyes are bony ridges that meet above the nose. They can be distinguished from some native Australian frogs because they sit upright and are active in the daytime in dense clusters. 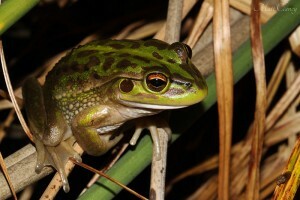 The Growling Grass Frog, for example, is endangered in Victoria. It needs habitat corridors along creeks and waterways, such as Merri Creek, to survive and flourish. 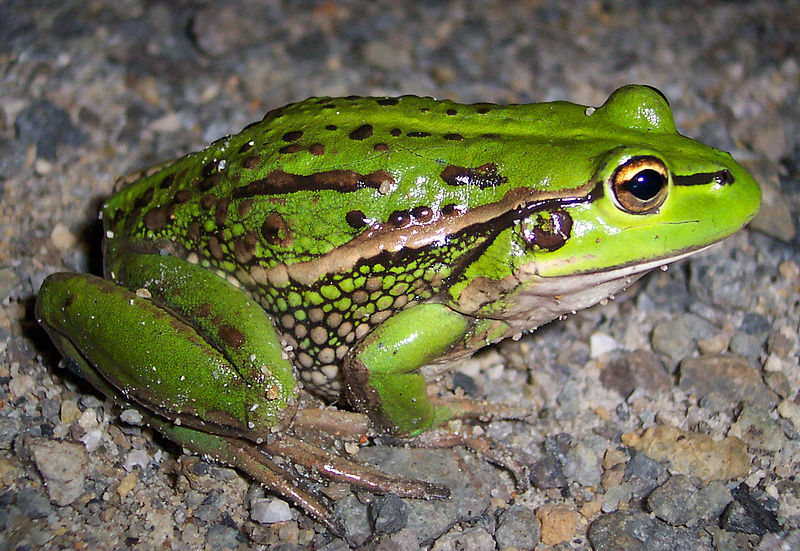 Studies by Melbourne University researcher Dr Geoff Heard show that the frog’s population has declined by 29 per cent in Melbourne’s north since 2001-02. The Growling Grass Frog conservation corridor along the Merri will be narrowed to only 50m wide and straddled by the town centre of Lockerbie, north of Craigieburn. Melbourne’s northern growth corridor will gain 11,000 new houses with the development of the former Lockerbie sheep station. Construction is due to start within months on a new community that will eventually house 30,000 people at Kalkallo, north of Craigieburn. It is estimated more than $986 million will be collected over the 30 to 40 years it will take to develop the growth corridors . The money will go towards buying land for reserves and management of the sites. The government will also release strategies to protect key species threatened by Melbourne’s growth, including the endangered growling grass frog and golden sun moth. Somehow, planners will have the contradictory task of trying to save endangered specie, yet at the same time promote housing growth! In the land famous for extinctions, the competition between housing/economic growth, and the protection of habitats for native species, continues to untangle, but the latter are always hindsight consideration – and collateral damage! A good ecosystem is the one with many species variety whereby it has less chances of being extremely damaged by natural disasters like climate changes or even human interaction. So as to help to keep the system healthy, each and every species has a niche in its ecosystem. Frogs mainly feed on insects as their main sustenance and also native pests whereby with this, the insect and pests population is regulated which could have been hazardous to the rest of the environment if it was not kept down. Forest streams have leaf litter as their main source of energy where animals feed on leaves and nutrients get released as a result of tadpole activity that becomes an advantage to microorganisms, algae and other animals. Frogs are generally considered to be good indicators of the local environments health. There has been increasing evidence that the use of herbicides and pesticides cause a massive threat to frogs. Herbicides are known to disrupt their reproductive systems. It is illegal to spray in water ways (this includes drains). You don”t have to go far to see dead grass along a roadside drain. Unfortunately the EPA currently don’t see this as a problem, and yet they are agency responsible to ensure our environment is healthy. Even if we are able to address the other threats to frogs, I strongly believe that our frog populations will continue to decline while use use poisons to manage our environment.